Fig. 57 Market structure-conduct-performance schema. a conceptual framework which identifies key characteristics of MARKET STRUCTURE, MARKET CONDUCT and MARKET PERFORMANCE (see Fig. 57), and facilitates analysis of the interrelationships between these variables. The structure-conduct-performance schema is useful for the achievement of COMPETITIVE ADVANTAGE over rivals. Structure and conduct patterns enable an analysis to be made of the ‘forces driving competition’ in a market, which, together with observation of market performance results, enables an assessment to be made of the actual and potential strengths and weaknesses of established suppliers. Established firms may be relatively cost-inefficient because of their failure to exploit ECONOMIES OF SCALE, or, because of inertia or limited marketing vision, neglect potentially lucrative market niches. Consideration of such factors may provide for successful MARKET ENTRY based on the establishment of optimal scale plant and MARKET SEGMENTATION strategies. The schema is particularly relevant to COMPETITION POLICY and INDUSTRIAL POLICY bodies in applying appropriate remedial measures to redress poor performance. For example, structural initiatives involving mergers and rationalization schemes may be the preferred means of reorganizing markets to eliminate excess capacity, or, alternatively, mergers between the leading firms in a market may be vetoed because they would lead to an undesirable degree of monopolization. Likewise, conduct measures may be used to improve cost efficiency and lower ‘excessive’ market prices and profit levels by, for example, the prohibition of price-fixing CARTELS, or the imposition of PRICE CONTROLS on dominant suppliers. Fig. 121 Market structure-conduct-performance schema. 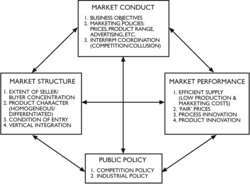 an analytical framework for investigating the operation of market processes. MARKETS are ultimately judged in terms of their economic performance, that is, how well they have contributed to the achievement of optimal economic efficiency MARKET PERFORMANCE (see Fig. 121) is determined fundamentally by the interaction of MARKET STRUCTURE and MARKET CONDUCT. The schema attempts to identify those structural and conduct parameters that have a strategic influence on market performance. These relationships have been formalized in the THEORY OF MARKETS. The market structure-conduct-performance schema highlights the interdependence of structure, conduct and performance and the extent to which each element can affect the others. Structure can influence conduct and performance; for example, a monopolistic market structure (see MONOPOLY) often leads to exploitative market conduct and poor market performance in the form of excessive prices and output restriction. Alternatively conduct can influence structure and performance; for example, firms seeking to increase their market shares by mergers and takeovers can raise the level of SELLER CONCENTRATION, which in turn will affect market performance. Again, performance can influence structure and conduct; for example, where established firms earn ABOVE-NORMAL PROFITS, this may induce other firms to enter the market, thereby decreasing market concentration and removing excess profits. Thus, rather than these relationships being sequential and deterministic, it is more accurate to view them as being circular. 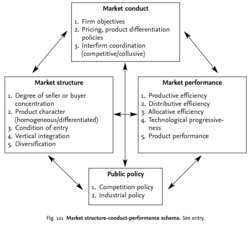 The schema is useful to public-policy makers (see COMPETITION POLICY, INDUSTRIAL POLICY) in framing measures designed to improve market performance. Such measures can operate on market structure, for example, by prohibiting mergers that increase market concentration or by encouraging mergers in industries suffering excess capacity. Alternatively, such measures may operate on market conduct, for example, by seeking to eliminate excess profits by prohibiting price-fixing agreements between firms. Additionally, the authorities may operate directly on market performance by regulating the prices charged by monopolistic suppliers.